There are three songs from this show on YouTube. Jon changed a couple of words in "Holly Lamb" and even repeated the last few lines. "Shoot High, Aim Low" was a little bit longer than the studio version (of course). "Love Will Find A Way" was (sadly) shorter than the studio version. some friends and i camped out at the spectrum for tickets. it was a chilly autumn night with sleeping bags lined neatly along a sidewalk outside of the arena. picture a laid back scene with everyone behaving themselves... except for one guy. he was there alone - not for tix, just to party. obnoxious, drinking heavily, and desperate for attention, he moved from one clique to the next, hoping for acceptance while mooching this or that. you know the type. anyway, the more he was rejected, the more he drank, the louder he got and so on. when he finally passed out, people cheered! the next morning, he quitely staggered away - right after taking a giant piss on the sidewalk in the middle of our little urban campsite. the show was great. my second time seeing them live. sure, it wasn't "classic" yes, but all of it was still so new to me, i didn't know any differently. what i remember most was the deafening and seemingly never-ending ovation after "heart of the sunrise". that's a completely overwhelming feeling being in the midst of 19,000 people screaming at the top of their lungs, all so happy, all in total agreement. can you imagine being on the receiving end of that? my all time favorite concert memory. also, tony kaye was hit by a bottle that was thrown from the crowd. our seats were first level, right next to the stage, just a few rows back on tk's side. i saw him run off stage with a towel to his face. don't know if that was cautionary, or if he was actually cut. They were opening with Almost Like Love at this point, which was a pleasant surprise. The other Big Generator songs came off well, especially Shoot High, Aim Low. And I always enjoy hearing Yours Is No Disgrace. All in all an average show, up until And You and I. The band simply nailed this one - one of the best performances of And You and I that I have ever heard. It sent goose bumps all over my body. 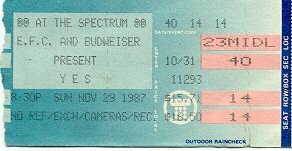 So inspired was I that immediately upon waking the next morning, I went to the Spectrum box office and purchased a ticket for the second show.